Elevate your relaxation experience with a sweet smelling homemade bath bomb! I’ve made my own bath bombs before for my own use and to give as DIY gifts. You can buy everything you need for them on Amazon! I like to put mine in silicone molds, but you can also buy the traditional bath bomb circle molds. 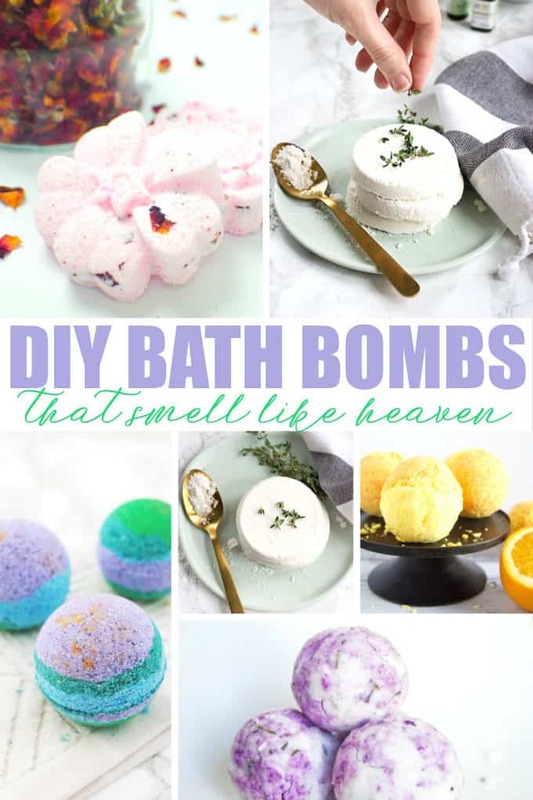 I’ve rounded up 20 DIY bath bombs that smell like heaven so you can try your hand at a few too! Which DIY bath bomb will you make first? wow,thanks for sharing i can’t decide which to try first! Oh this is cool , I have wanted to try making my own , but I had no idea if it was hard or where to even start ! I’d like to try this for fun , it would be cool to give these homemade gifts if I do well ! What a fabulous list you have provided, thank you. I’m going to try the DIY Grapefruit Bath Bombs. I love citrus and I love pink. So pretty. And the ingredients sound luxurious. I really should try making some of these, love bath bombs but also like knowing what is in them. Thanks for sharing! I love that they are so much healthier than store bought bath bombs. I rarely buy bath bombs because they are too pricey for me to use once but I’ve never thought about making them myself – I’d love to try! The selection here sounds incredible. I think the Lavender one would be perfect for me, but the Sakura Green Tea looks pretty neat too! I think I would try to make the green tea bath bomb first. Awesome, always wondered how they made these. These would make a great gift and they look so easy to do! Oh this is cool , I have wanted to try making my own! Thank you!